Recorded in various spellings including William, Williams, and Williamson, this is a surname which can be of English, Scottish, Irish, and Welsh origins. Wherever found it is ultimately Germanic, and was introduced into England and Scotland around the time of the Norman Conquest of 1066. Carried by four English kings, it derives from the personal name "Wilhelm" composed of the elements "wil", meaning "of strong mind", and "helm", translating literally as helmet, but in this context meaning "protection". As a patronymic the short form of "s", meaning "son of", is often added, although the name is popular particularly in Scotland in its long style of Williamson. Political correctness is not a new phenomena, and after the accession of King William 1st in 1066, the name became the most popular British personal name, and with the creation of surnames from the 12th century, an equally popular surname. The list of prominent holders of the surname is almost endless, but one of the more unusual could be said to be the famous republican Oliver Cromwell, who "reigned" in England from 1650 to 1658, and whose family were formerly called Williams. They held extensive estates in Wales, but under instructions from King Henry V111 (1510 - 1547), the family name was changed to Cromwell. Griffith Williams, (1589 -1672), was the bishop of Ossory in Ireland, and a staunch supporter of the martyrd King Charles 1st. Edward Williams, (1746 - 1826), helped to preserve the ancient Welsh language being Chief Druid and bard of Wales. 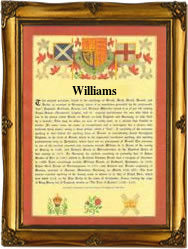 The first recorded spelling of the family name is believed to be that of Richard William. This was dated 1279, in the "Hundred Rolls" of the county of Oxfordshire, England.